I'm not sure if you are familiar with the name Gary Patterson, but you'll likely recognize his work. Gary's cartoons have remained substantially successful for over 40 years now and are a top selling art brand. 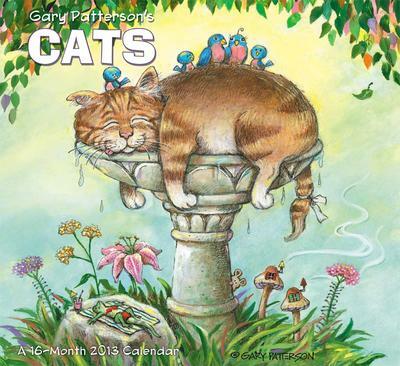 When it comes to capturing the fun-loving spirit of our cats, no one does it quite like Gary. Pairing adorable cats with brightly colored, comical scenes, Gary's drawings capture the irresistible characters of these much loved pets. Love your cat calenders. I have 8 of them and was so happy when Katrina didn't claim them. Every month - a new funny picture, love it. Your calendars are great. I always buy them and other cat calendars. Love cats. You're an absolute genius! LOVE my 2013 calendar, especially, how to sleep with cats..I know this sooo well! Thank you so much for putting into art, what I live every day! Join in and write your own page! It's easy to do. How? Simply click here to return to Cartoon Cat.